1. Will Cal continue to come up big in the clutch? In 2010, Cal lost a few games in the last moments of the game including the very last game against Washington that eliminated Cal from bowl eligibility. However, it seems that Cal has a new toughness that have been engraved in them. It could be that Tedford is calling the offensive plays now, it could be the new “Team Matters” focus, it could be the new coaches placing a new mentality in the Cal Bears, or it could even be the sixth-sense brotherly connection between Zach Maynard and Keenan Allen. Whatever it is, it pulled through in overtime against Colorado. After Colorado scored a filed goal in overtime and Cal was pushed back to the 35 yard line, most Cal fans probably thought,”We’ve seen this before. We’re not going to pull it off”. However, Zach Maynard and Keenan Allen proved all those doubters wrong. If Cal can continue to make big plays near the end of a game, especially on the road, the Bears can definitely compete with the top dogs of the Pac-12 for the Rose Bowl. 2. What is wrong with Cal’s defense? Luckily, Cal will not face an athlete as great as Colorado’s WR Paul Richardson this Saturday against Presbyterian. However, defensive coordinator Clancy Pendergast will have a lot of work to do in order to shape up his defense before facing elite QB to WR duos like USC’s Matt Barkley and Robert Woods. The Bears could not get a single sack on Tyler Hansen, even though he was sacked seven times against Hawaii. Every time Cal brought a blitz, Colorado countered with a screen to their running back or wide receiver. CB Marc Anthony could not keep up with Paul Richardson, but near the end of the game Richardson happened to line up on CB Steve William’s side and Steve Williams had a clutch pass breakup to prevent a touchdown. In the future, Cal may need to assign Steve Williams with the opposing team’s best wide receiver or at least have a better double coverage system against elite wide receivers. This problem on defense is the reason why teams like USC and Stanford were able to blow out Cal last season. 3. When will Cal’s offensive line get better? Once again, Cal’s offensive line continued to struggle. They allowed three sacks, made mental mistakes at the worst possible moments, and did not make holes for our running backs to run through. Unfortunately, Cal doesn’t have a running back like Jahvid Best or Shane Vereen who can make their own plays, hit holes with great acceleration, and also shed a few tackles. This means that the offensive line need to make their assigned blocks on time or Cal’s running backs will go nowhere. During pass protection, the offensive linemen were indecisive on which player to block, which confuses whichever tailback is behind them (luckily Isi was able to make some important protection for Zach Maynard). Let’s hope that the offensive line can fix any issues against Presbyterian so that they are ready for Pac-12 play. 4. Who is this C.J. Anderson? Backup running back C.J. Anderson had four carries for 33 yards, including a 19 yard touchdown run and a crucial one yard run in overtime on a 3rd and 1 that allowed Cal to keep the series going. After the game, Coach Jeff Tedford recognized Anderson’s performance and said that he deserves more carries. C.J. Anderson will most likely continue to be Cal’s short yardage back because of his ability to shed tackles while keeping his balance. Anderson seems to be a mix of JJ Arrington and Justin Forsett, and he seems to have the physical ability to run through tackles and take the hits on every play. He will most likely receive a major number of carries against Presbyterian this weekend and possibly share more carries with Isi throughout the season. 5. Will AT&T really be a home away from home? 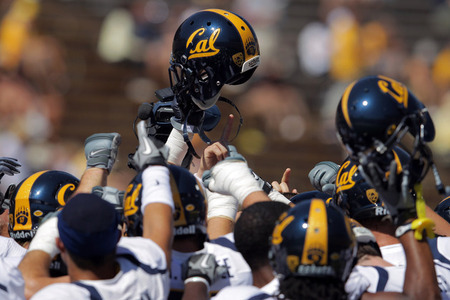 This Saturday, Cal will have their home opener against the Presbyterian Blue Hose at AT&T Park. For the first time since the Emerald Bowl back in 2008, Cal will play at this stadium. The big differences for this stadium is that the student section will be at one of the endzones instead of on the 50 yard line, the seating capacity is half the size of Memorial Stadium, and the field is very close to the walls within the stadium. Since the SF Giants only have a 1 in 250 chance of making the playoffs, the dirt part of the field will be replaced by the homecoming game against USC. With the student section at the endzone and a much smaller attendance, will the Cal fans make enough noise at AT&T Park? As long as the fans attending the games are yelling their hearts out, AT&T Park could be just as loud or even louder as it was in Memorial Stadium, just look at the small stadium teams like Nevada and Boise State.